The maximum day temperatures, these last 4 days, were below normal by a whopping 11c in some cities of Punjab, Haryana, Delhi and Uttar Pradesh and by 4 to 6c in some regions of north Rajasthan, Bihar and some parts of northwest Madhya Pradesh. Some low day maximums, recorded in the plains of North India between 8th. Jan and 12th. Jan were: Chandigarh, Ambala & Amritsar 9c (-12c), Bikaner (Rajasthan) also 9c, Lucknow 11c (-11c), and Delhi 12c (-9c). Lows at night were somewhat slightly below normal , as the dense fog kept the day temperature low, and prevented the minimum temperatures from dropping. However, Amritsar and Adampur, alongwith Abu maintained the 0c level in the plains. A sudden one day dip saw Jaipur drop to 2c on the 10th. In Pakistan, Islamabad records a low of 0c. Now, a W.D. 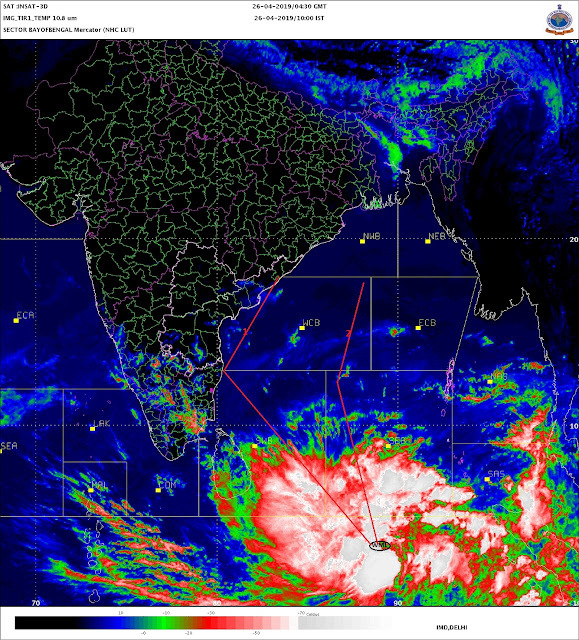 is fast appraoching the Northern regions of India, and currently today, the system is over Pakistan. As a result, firstly we will find an immiediate relief from the dense seasonal fog over the plains, as the region comes under the influence of a westerly trough. Then, from Wednessday 13th. and into Thursday 14th,, the prevailing cold north to northwesterlies would get replaced by moderate westerlies to southwesterlies as the W.D. moves into the Indian region, and precipitates rain in the plains and snow in the hilly states. Now, this rain system will generally effect the night temperatures as well, and result in the minimum temperatures to increase by 2/4c during the next 2/3 nights, and to abatement of cold wave conditions. Rains could occur in The Punjab, Haryana, Delhi, and western U.P., while we will see snow in H.P.and Kashmir on Wednessday/Thursday. Some of the lower hill stations of Uttaranchal may recieve this winter's first snow flurries. There is a posibility of a secondary low forming in the Rajasthan area on Thursday. What that this lead to ? It means westerlies from the W.D. will meet the easterlies from the bay somewhere in the central India regions. Resultantly, producing precipitation in M.P.and south Maharashtra, on Wednessday/Thursday. In the aftermath, say from Friday, cold northwesterlies would again sweep the North and Northwest areas, and once again lower the night temperatures there. Cold winds may also sweep the Rajasthan, Gujarat, M.P.and Maharashtra regions from Thursday. I would expect the temperatures to drop substantially in these regions from Thursday/Friday. If the movement of the W.D.is according to this estimate, I see temperatures in Gujarat and M.P. dropping to 4/5c below normal and Gujarat and M.P. cities reaching below 10c, and Maharashtra cities going down to 8/10c by Friday. Mumbai will continue with its "warm" trend of 24c minimum for another 2 days. Clouds will be the main culprits these next 2 days. Expect a drop to 18c on Friday, and a weekend temperature range of readings between 28c and 16c.